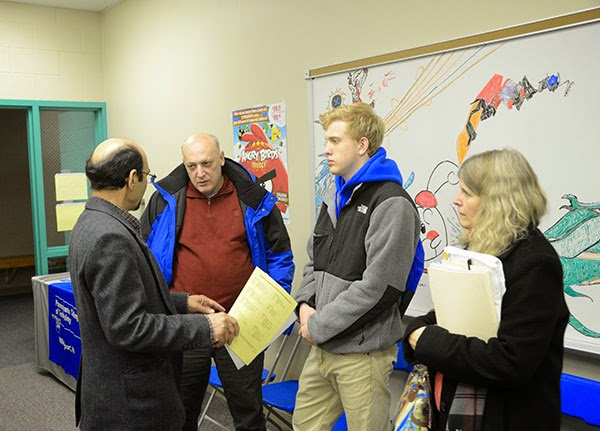 My programming teacher talking to parents at a recent Open House. Making collisions for Unicorn Training maps is taking longer than expected. A 2 day assignment has become a week-long event. A miscalculation from inexperience that won't happen again. I may have been done quicker if I mapped collision boxes to the tileset beforehand but I wanted to make more dynamic shapes with them so I did it the way I'm used to. Silly rookie me. To fill up the time I should restate my slightly altered plans for the upcoming Junior year of college I'll be suffering through attending. I'll be finishing Unicorn Training in the fall then immediately doing a quick arcade title before winter break. Over the vacation I'll be in pre-production for my Mobile Development class project which I couldn't be any more hyped to do. Get a lot more details on these upcoming projects and this semester's plans below. School work is certainly going to be an intrusive pain but I'll do what I can to minimize the amount of time my classes consume. I can't get any scholarships and my portfolio speaks for itself so grades really don't matter. I'll aim for an A but if I fall short there's nothing to lose. I've put top grades for my parent's sake as a priority for far too long. I also need to stop going overboard with class projects because I always want to raise the quality bar even when the teacher requests something simple (see my Phoenix Wright game). I look at my classmate's work and think about how I could do mine so much better but I really shouldn't. There are more important things to dedicate myself to now. School gets you a piece of paper that will keep your cover letter out of the trash if you're unable to survive on your own. No matter how hard I try or stress out over a little test that piece of paper won't get more valuable in an industry that looks for experience and performance ability. I'm dedicating my remaining half of college years to finally making the epic games I've dreamed about since high school. The arcade game I'm making this winter is a stand-in for the Dragon RPG of numerous changing titles I've been wanting to do since 10th grade. This will be a short hack & slash survival game built for replayability. It'll introduce the lore of the world and the future game's protagonist just like Unicorn Training. I'll post everything I have written down for it once I get started. The reason I'm making it so quickly is so I can finally secure the Trademark I've been extending for it since I started Yotes Games. I thought it would be one of the earliest games I did but after TriGrid I realized how very unprepared I was. I needed to make a lot more practice games and each of those took longer than expected. Even now I know I won't be able to tackle this particular dream project for a few more years. I might not even be able to make it on my own. So instead I'll release a smaller version. One even smaller than the reduced version I planned to make for my Senior Capstone project. Instead of an RPG this will just be a sort of combat tech demo. You'll be slashing through ghostly enemies in a dark room and leveling up as your round goes on. Charge up super moves and do some screen clearing on a grid based movement system that I plan to carry over into my Mobile Development project. As far as monetization goes, I want it to be free since it's so simplistic but I have to be making some sort of attempt at income in order to register the trademark for the title as in-use. I'm considering a simple ad on the main menu, charging just a dollar for a highly polished simple product, or experimenting with a video ad system for continues in a way similar to Sonic Dash. Ads seem intrusive and may pull players out of the zen I want the game to put people in and I'm not really planning to make much from it anyway. Kids learning Game Maker in the school's Gaming Lab. On one hand if it's really good I may make a lot from selling another dollar package alongside Unicorn Training which would go toward buying a Mac so I can port to iOS. On the other hand I can make it free and get it into as many hands as possible to boost my reputation. Trouble comes from needing it to be profitable in some way to satisfy the trademark requirements. In-app purchases are out of the question because I refuse to do those again and ads face the problem of where to put them. I've already paid for the trademark and paid for an extension too. I believed the name was so simple that anyone could take it at any moment and I can't imagine my game being called anything else because he name fits the theme and world lore perfectly. Regardless of what monetization I do the Dragon game will be out before Christmas and keep Unicorn Training company in the Android app stores. During that time I'll be in a frenzy as I can finally get started on planning out my turn-based pony RPG series. I can't actually start developing/testing things until the first day of class but I am permitted to do whatever I want on paper. There's a lot to plan out so there's no reason to cheat the rules and get ahead. If everything goes smoothly, Unicorn Training and the Dragon game will steadily bring in cash that I can put toward a Mac while I spend all of 2015 on the Pokemon inspired RPG. I'll be putting everything I have into that project because it will be the career defining one that I hope can completely cover my student loan debts and pay back my parents. I need that financial security to allow me to shift focus on saving up to start/maintain a game studio post-graduation. My current and next project stand as practice for what is to come. Unicorn Training has done a great job of teaching me what it's like to make an RPG and getting my name out there. The contacts I've made and new people I've intrigued are the greatest rewards it had to offer. Everything I'm doing is shaping me into a developer capable of delivering the huge promises I keep dreaming up. All I can think about every day is the kind of person I'll be 1,2, or 4 years from now. Yotes. Head honcho at Yotes Games and creator of the best RPGs available on smartphones.